Every year has its collection of random and rare market occurrences. 2017 broke many records with its low volatility, lack of intra-day movement, and positive moves; for the first time in history, all twelve months of the year were positive. 2018 appeared to be a bit of a reaction to the extremes of 2017. Overall, a rolling global bear market created one of the worst years across asset classes in the past decade. There was nowhere to hide in 2018 as both domestic and international equities, as well as fixed income, high yield, and even commodities such as gold and oil, finished the year in the red. In 2018, the market was a rollercoaster at the beginning and end of the year with a calmer ride during the middle. Even though 2018 was the first negative year in the stock market since 2008, to many 2018 seemed like a “typical” year since it only finished down -4.38%. But that number masked record-breaking corrections and unique never-before-seen occurrences. The chart below illustrates some of the larger moves up and down from 2018. It highlights the whipsaw nature of the first and fourth quarters and the sharpness and severity of the corrections associated with those two selloffs. But a lot of strange or rare occurrences happened in 2018, from either market movements or in the area of volatility. Across-the-Board Poor Performance: First year where all major asset classes underperformed cash since 1984. Stocks and 10-Year Treasuries End Negative: First year since 1969 where both stocks and the U.S. 10-year treasury were negative in the same year. Strong, Positive Start Ends Negative: Typically, strong up markets finish the year even stronger, but this was not the case in 2018. 30 times in the past 49 years when the market was up 10% during the year, as it was at the end of September in 2018, the market finished better by the end of the year 87% of the time (26 out of those 30 times). In addition, when the market finishes green in the first three weeks of the year, 17 out of the past 17 times the year had finished positive. But not in 2018. Surrendering Gains: In the past half century the market had never finished negative after being up more than 10% during the year. Of the 30 times the market had intra-year gains of 10% or more, 2018 was the first year in the last 50 where the market ended up in the red. The last time it had done this was 70 years ago in 1948. Oversold Conditions: Christmas 2018 saw the second most oversold conditions in the past three decades, as defined by percentage of S&P 500 members at new 52-week lows. Only during the fourth quarter of 2008 were conditions more oversold, at the depth of the Global Financial Crisis. 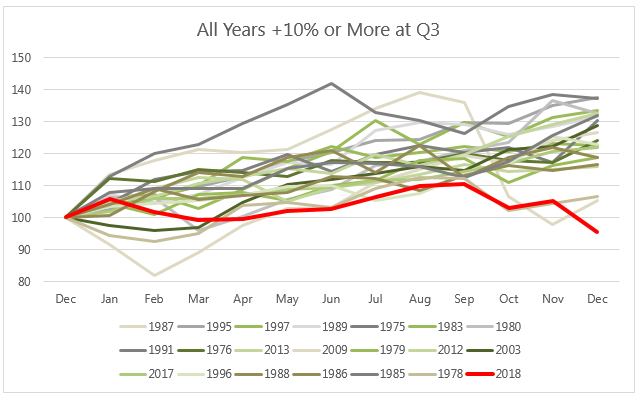 Reversal of Fortune: When January has been up more than 5% as it was in 2018, markets have finished the year even higher 92% of the time and positive on the year 100% of the time since 1950. Except in 2018. Only 1986-1987 and 2007-2008 had larger year-over-year change in realized volatility than 2017 to 2018 (6.8 to 17.1). 2018 was the only year since the VIX began in 1990 with 3 separate -6%+ corrections in 10 calendar days or less where each began with the VIX below 17. From 1990 to 2018, there had only been 3 others previously (July 2007, Aug 2015, and Jan 2016). Speaking of fast sell offs, 2018 saw 7 separate -6% or greater corrections within 10 trading days; only 2002 and 2008 had more in one calendar year since 1990; the cumulative move of these 7 corrections was just over -47%. The VIX had its largest one-day increase in its history on February 5th, 2018, now known as “Volmageddon”, increasing 116% in one day (prior record had been only a 64% increase in February 2007). The VIX had 12 one-day VIX spikes of 20%+ or greater, more than any year since its 1990 start, surpassing 9 occurrences in 2011. The VIX, for the first time ever since 1990, moved from above 35 to below 20 in only 10 days during February 2018; that is, until it did it for the second time in late December 2018/January 2019. Finally, virtually all of these unusual, volatile events were packed into just two quarters: Q1 and Q4 of 2018. The second and third quarters were mostly docile. Should You be Bearish or Bullish? So, what does all this mean for 2019? As of the end of January, 2019 began with the fifth best January since 1923. A reason to be bullish? Not necessarily. Evidence that 2019 will be just like 2018? No. Does it mean anything as to the rest of the year’s action? Nothing—just data points on what has happened in the past based on a random, calendar-driven frame of reference and the complex movements of a broad U.S. stock market index. It’s important to not let confirmation bias decide something for you. Confirmation bias is the tendency to interpret evidence as confirmation of one’s beliefs or theories. Of course, this could be said about any attempt to predict the stock market one way or the other. What the market has done in the past has no bearing on what it will do in the future; it just provides a frame of reference for what could be considered normal or abnormal. There’s an old saying, “The more things change, the more they stay the same.” It is important to remember that while each year in the markets is different, fundamental truths persist through the decades. Each year in the market brings about new records, new firsts, new never-before-seen events and occurrences. Yet understanding where the market has been and where it can go is an important part of defining and understanding risk, so it can be managed. At Swan, we believe a proven, consistent, approach to mitigating downside risk over a full market cycle can potentially help investors accept the risks that are in the market while ignoring the noise that comes with ever-changing calendar year environments. Because it is impossible to know what the market is going to do, we are always invested and always hedged. Whatever 2019 brings, here’s to defining risk and a prosperous year. Micah Wakefield, CAIA®, Portfolio Manager and Director of Research & Product Development, helps oversee and review the core equity holdings for the strategies and assists with daily risk assessment and position review. He also leads research and development of strategies and products at Swan. Market Forecasts and the Value of Predictions Every year experts rush to publish market forecasts. But how accurate are these predictions? See how reliable market forecasts are, and why we at Swan don’t make them.